My name is Kent Anderson and I was raised in Northwest South Dakota in the small town of Lemmon. My earliest memories of hunting started south of Lemmon on a friends farm and ranch. I can recall getting up at 4 a.m. with my friend Stephen and cooking bacon and eggs for breakfast then venturing out into the tree rows and hunting small birds and rabbits, that we were lucky enough to find, with our BB guns. This all started when I was around the ripe age of 7 or 8 and Stephen would have been around 5 or 6. Over the years Stephen and I along with some other friends still manage to get together from time to time to hunt together and continually create lifelong memories. I have always had a great passion for the outdoors and it was created in me by my father and brothers. I always remember when November rolled around it was time for deer hunting. My earliest memory was with my dad, when he and my brothers went down to the area where my dad was raised. It was located 20 miles south of Lemmon, and we would hunt there every year. This specific year my brother Kirk brought some friends and they walked the creek bottom while dad and I waited for the deer to come. My dad ended up shooting a nice 3x3 mule deer. I was too young at the time to hunt, but always got to go along for the ride. Over the years I have picked up tactics my brothers Todd and Kirk have used, which have continued to make me more successful. I also have done a lot of trial and error on my own, which most of the time can be very frustrating and rewarding at the same time. I now reside in Helena, MT. Montana is a great place to hunt as there are tons of species to chase after, and a long hunting season helps facilitate doing so. Another beneficial thing about MT is that there is a vast amount of public ground, as well as block management areas to hunt. I mostly hunt public ground, but have been fortunate to gain access to some private lands. I am very fortunate to have a wife that allows me to spend as much time hunting as I do. Leah is very supportive of my addiction. I have one son and one daughter. I am very excited to have a couple of little hunting buddies I can pass along my knowledge to. I look forward to the future when I can take them with me to the field and watch them take their own game. I think it will be more exciting for me to watch them succeed than myself. I was very fortunate to watch my brothers Todd, Kirk, and Luke raise their families and set examples for me on how to become an amazing father. I also take great appreciation and pride in my father and mother for raising me the way they did. They taught me how to live the right way and become the person I am now. I can only hope to do the same for my children. When I'm not working I can usually be found out in the field somewhere hunting something or spending time with family. On average I spend around 30 to 50 days in the field when time permits every spring and fall. With a growing family and busy schedule that can sometimes be tough. 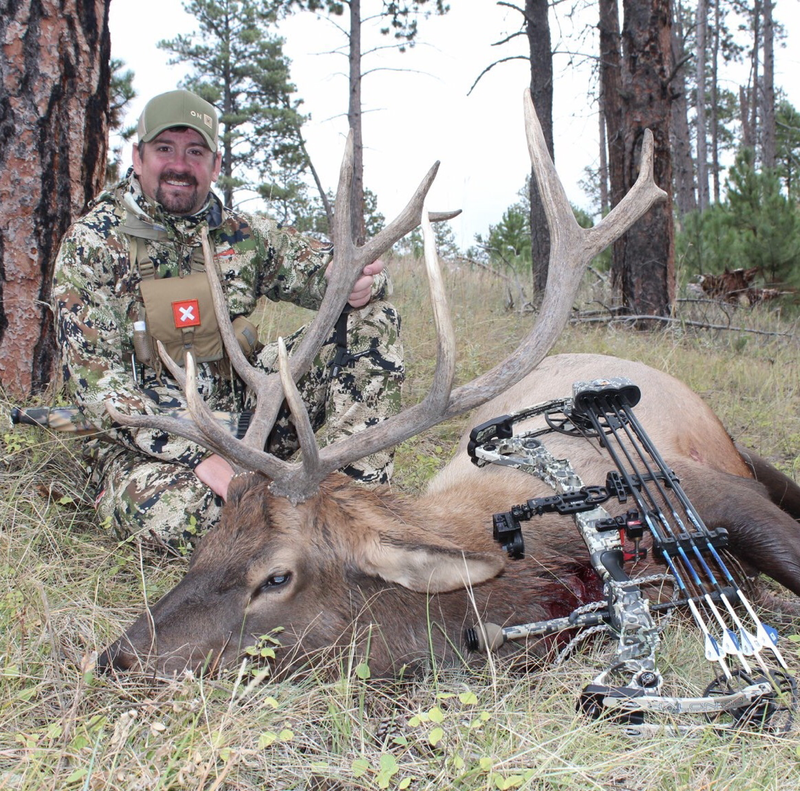 I have been privileged to have the support and belong to the pro staff teams of onXhunt of OnXMaps, Rocky Mountain Hunting Calls & Supplies, staff writer at Earned Media staff, hunting staff for Bohning Archery, pro staff for Tall Tine Bowstrings, and most recently the pro staff teams of Grim Reaper Broadheads, and Element Archery. There are also several other companies I rely on and they can be found in the gear and equipment area. As I continue to have the privilege of helping out what I feel are the best companies in the industry it fuels my passion to be as successful as possible. I am not a professional by any stretch of the imagination, but I hope the things I do for the industry leaves a positive light for those just getting into hunting. If you have any questions on their products or the products listed in the gear and equipment area please email me and I will be glad to answer your questions.